I may be one of the few people out there who saw some potential, even some recognized potential in the first Kane & Lynch. It wasn’t markedly good, but it wasn’t as bad as some make it out to be. My initial hope for Dog Days was that IO would learn from their mistakes with the first game. I set myself up for disappointment because Kane & Lynch 2 took giant leaps backwards in almost every conceivable way. Version Reviewed: PCPlayers starting out on the shamefully short campaign will be immediately tossed into a few very brief and confusing cut scenes of the titular duo being tortured, followed by the actual beginning of the game leading up to that point. The story itself is actually far less interesting than the beginning scenes would have you believe. Kane and Lynch embark on a trip to Shanghai in order to complete an arms deal, but everything goes wrong for the pair, and the player, when the daughter of the main antagonist is murdered. Kane & Lynch set out to escape, and they eventually become the aggressors, and that’s all the substance there is to the story. A short drop and a sudden stop describes the single-player campaign perfectly; it takes 3-5 hours to beat, ends very abruptly – oh, and it should hang itself too. Lynch on the other hand, shows no personality whatsoever now that his numerous instabilities have been wrangled in. Their relationship is non-existent. While playing through the game it seems as though they just happen to always be at the same place at the same time, rather than being partners in crime. The one exception to this is a mission where a naked and scarred Lynch comes to in an alley, realizing that Kane is still locked in a sterile room being tortured by a madman. 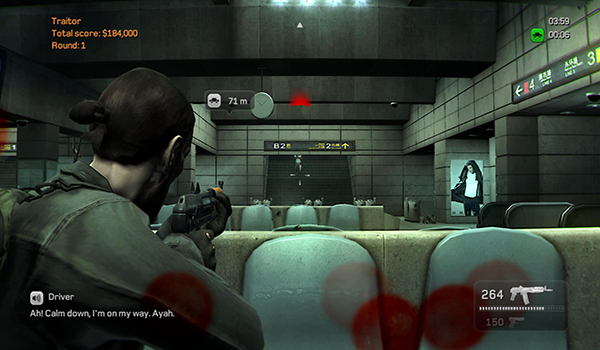 Gameplay-wise, the game is the exact same gunfight over and over again. The only unique and genuinely fun mission is an epic on-rails style helicopter assault which is as unfortunately short as the rest of the entire misbegotten campaign. There is a pretty decent amount of variety in the enemies you’ll be facing. And by that I mean, there are a couple of different models, but they all feel exactly the same and require no change in tactics from one to another. It’s tremendously repetitive and not all that fun even the first time, let alone the 50th. In Kane & Lynch 1, guns were so pinpoint accurate and enemies were so squishy that even the hardest difficulty became trivial. Kane & Lynch 2 addresses this problem with all the grace of Helen Keller swerving through traffic. Unless you are playing on easy, enemies sponge bullets up like lead-absorbent tampons. As for gun accuracy, it doesn’t exist, at least not early on. Additionally, the camera is very hit or miss. It sometimes works properly, and is as responsive as it needs to be. Unfortunately, it is also quite prone to bugs which cause it to not move properly over the shoulder, and rather it will slowly pan and stop at an angle of use to no one. If you can make it through the campaign without it bugging out on you, you are a luckier person than I, otherwise you may be tempted to put your monitor/TV through a wall. As for the newly revised cover system and down-but-not-dead mechanic, neither works as well as they should. Hitting a specific button to snap to cover is actually slightly more wonky than just sliding into it, and sets you up for a number of scenarios where you have to angle yourself perfectly unless you want to just repeatedly slide into an adjacent piece of cover. It really doesn’t matter though, since most enemies seem to possess the ability to bypass a large amount of your cover anyway. Down-but-not-dead is not particularly helpful either, and it will usually just leave in an awkward and vulnerable heap on the floor. The animation for getting up is long and slow, and odds are if you got downed from behind cover it won’t do you much good immediately going back to it. For an otherwise forgettable, bland, third person shooter, the extreme difficulty is actually a decent challenge, although I couldn’t discern whether or not that had anything to do with the numerous frustrating, misery-inducing camera bugs and tedious repetition. I played all but three missions on extreme to test the auto-aim and concluded that the in-game setting to turn it on or off does absolutely nothing. On easy and medium it appears to be on regardless of whether or not you turn it off, and it can’t be toggled on at all on hard or extreme making the option to toggle it completely pointless. This game is a collection of design abortions heinously sewn together in some Frankenstein-esque fashion, proudly flaunting the fact that all sense and reason were thrown to the wind. What little credit IO deserves for Kane & Lynch 2 is due to the voice acting being spot-on. Additionally, the presentation and art style are both highly unique and interesting ideas. 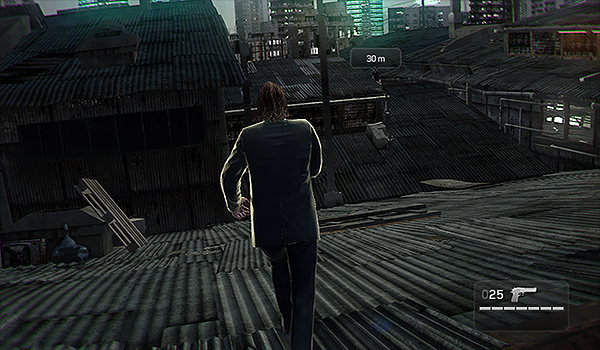 The shakiness and gritty filters mimic an eye-witness with a camcorder trailing the murderous duo and documenting their activities in Shanghai. The only problem here is that it isn’t conducive to the gameplay, and may even become nauseating. This isn’t nearly enough to salvage this colossal wreck of a campaign though. Fragile Alliance is as interesting as it was in the previous game, and is now available as a single player experience to boot in arcade mode. The players you get matched with will determine how enjoyable this mode is. Cops and robbers and undercover cop are essentially the same game mode, with cops attempting to stop the robbers from getting away with a heist, except one player on the robber’s team will be handpicked to work against the robbers in undercover cop. There’s nothing particularly new in those two modes, but they work well enough. 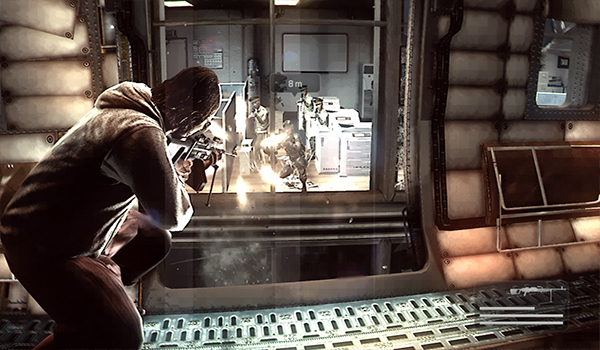 Efforts made to make the game’s multiplayer interesting are largely thwarted by the game’s broken core mechanics and lack of host migration. Just because the game modes themselves aren’t broken won’t stop the rest of the game’s foundation from making the multiplayer experience just as miserable as the single player. At best Kane & Lynch 2 could have been an average title, borrowing from the blandest of third person shooters and bringing nothing new to the table. However, IO have fatally crippled the game with unresolved glitches and bewildering design choices. 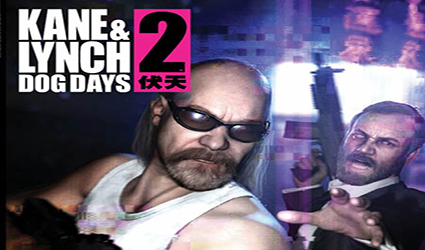 Mechanically, Kane & Lynch 2 is not a terribly clever or inventive game. It is as generic a third person shooter as they come; a genre which has been around for way too long for the basics to be this poorly executed. Dog Days possesses both insubstantial quality and quantity. Do yourself a favor and avoid this like the plague.